Having learnt the use of a chainsaws at an early age on the farm I have since learnt a lot about trees and types of wood etc. I have now found the art form for which I am now practising and love the art of chainsaw carving wood sculptures. All my carvings are made from trees which have either fell naturally or need to be felled for woodland management purposes. I try to make the trees come back to life with all of the beauty of the wood showing through. As a chainsaw carver Based in the heart of North Wales I make a range of bespoke, wooden chainsaw sculptures from 2 foot owls, 7 foot Wizards, to large tree stump carving, and each one is filled with character and charm. I started carving, using my skills with the chainsaw, and my interest in art from my school years. 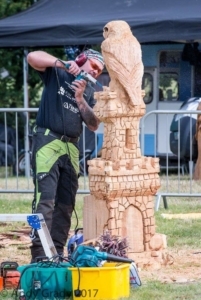 I am more than happy to attend shows and events to demonstrate chainsaw carving, Fully insured, great entertainment and a fantastic crowd pleaser, people can see carvings being created from start to finish.